An okay Bond movie that misses the mark on its villains, and barely hits it with the action scenes. This is a very average Bond film. It’s meant to be the movie that rounds out the Daniel Craig era. As such, it does some nice work with referencing the previous movies and connecting the series together. The problem is that this movie falls short on the ways that matter most. The villains are mishandled and given far too little screen time. And then there’s the action scenes, which are just okay. This movie could have and should have been a whole lot better. Daniel Craig is the best Bond that there has ever been. That’s an opinion, of course, but his movies are clearly the perfect fit for today’s day and age where dark, gritty, and realistic is the tone that sells. Nobody wants to see a mastermind coming up with crazy sci-fi devices that do impossible things and control the world. The age of Bond movies going to other planets or even into satelite territory are long gone. Instead, what we have here is a spy series that has taken what the Bourne movies accomplished and brought it to the next level. That’s what we got from Casino Royale and Skyfall, anyway. Continuing the pattern of every other film in the series being good, Spectre (the 4th Craig movie,) ends up more like Quantum of Solace (the 2nd,) than like those other two films. That’s unfortunate, because it’s the same director here, returning from Skyfall, and instead of a continuation, this movie looks like a grab for leftovers. Sam Mendes, the director of both films, is an incredibly skilled filmmaker who knows where to place the camera and how to move it around. This is a guy who gets the best shots whenever possible. But when the script doesn’t work, there’s very little that cool camera movement can do. There are lots of problems with Spectre, but most noticeably, it’s the villains that just don’t work. They simply are not given enough screen time or material. And then there’s the action, which is also lacking. When you think of the Mission Impossible movies, you think of incredible and memorable stunts. The Fast and Furious movies (dumb as they are,) have gone that way too. And the better Bond films have them as well. 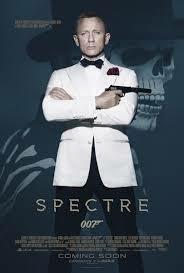 With Spectre, the action might be okay, but it’s certainly not in any way memorable. The movie opens in Mexico City, during a holiday parade for the Day of the Dead. Giant floats of skeletons move down the streets. Everyone that is walking around wears a skeleton mask and outfit. We follow one of these people who walks alongside a woman into a hotel, up some stairs, down a hallway, and then into a room. There’s some humor here, as the man ends up going out the window, unexpectedly. Pretty soon James Bond is on the move, going after a target, and we get a building collapse and chase through a crowd that leads to a fantastic helicopter fight. This is by far the best action sequence in the movie. Most of what looked great in the trailers for this film (the upside dowm helicopter, the building tumble, the skeleton masks,) comes from this opening sequence. The issue then, is about what content will be left, for the rest of the film. After taking out his target and leaving Mexico City, we join Bond back in London, where he is reprimanded by the new M, played by Ralph Fiennes. The last Bond movie, Skyfall, gave the returning cast a total makeover. We got a new M, a Money Penny, (Naomi Harris,) and a Q (Ben Winshaw.) Notice how characters who were in both of the first two movies (like Felix, the CIA agent, played by Jeffrey Wright,) are nowhere to be found anymore. That’s Sam Mendes not only putting his mark on the series, but trying to keep it there. They’ve put together a nice ensemble cast at this point. Too bad the story isn’t quite up to the skill level of the performers. Back in London, Bond finds out that there’s a new surveillance program where everything that the Double O program does is being watched by a higher power. There is a merging going on between the Double Os and the MI5s, and this surveillance system, that oversees everything, is the result. Funny how the new Mission Impossible film, (Rogue Nation,) is all about merging the MI team with the CIA, and now here, we have the Double 0s joining the MI5s. It’s enough to make your head spin. Here, in Spectre, the new program is being overseen by a man named C, who seems to have M wrapped around his finger. Bond goes to see Q, (these letter names start to get annoying after a while,) and finds out that Q has been asked to implant Bond with a device that will track his every move. Q tells Bond that it will take 48 hours for the device to be activated. That’s Bond’s not to get out of London fast, while he still can. He escapes the country before the device is activated and heads to Rome. We saw a video left by the former M (Judi Dench,) that explained why. Bond was instructed by her to kill the man in Mexico City and then attend the funeral. That funeral is being held in Rome. Once there, Bond quickly finds the mans widow (Monica Belucci,) and she leads him to a secret organization. Bond attends one of their meetings, by blending into the background. This is a board room meeting of sorts where a man named Mr. Hinx (Dave Bautista, of Guardians of the Galaxy,) walks in and kills someone. We also meet the head villain, Oberhauser, (Christoph Waltz,) who spends most of the scene in silhouette and shadow, hiding his face from the audience. The organization (which is known as Spectre,) knows Bond is there. They go after him, and it leads to a car chase around Rome at night. This becomes the closest thing to the LED China scene in Skyfall, which was absolutely incredible. Here, the Rome car chase sequence is just okay. The positive is that Bond gets to use some of the cool devices on the car. The negative is that the climactic moment is barely shown. It involves an ejection seat, and we get to see the before (Bond strapping in,) and the after (landing in a parachute,) but not the part that counts most, the moment of ejection. It’s a lousy ending to what was otherwise a pretty cool scene, but you definitely feel the cop out as Bond comes landing in, from off screen, and you realize we never actually got to see him in the air, save for a blurry, blink and you miss it, image, of something popping out of the car. From here the movie takes a turn for the worst. If everything we got so far was cool, then the pace is about to be slowed way the hell down. We start to get scene after scene of one on one meetings as Bond traces after clues. He goes to see Mr. White, then Mr. White’s daughter, and then the hotel that she used to stay at with her father. There’s a plane chase at one point that ends with Bond slamming the plane into cars, and the scene really needed to go further. Mr. Hinx was in one of the cars. This movie should have had him get out and fight Bond. A hand to hand combat scene here on the mountainside would have been perfect. This movie wasn’t interested in that sort of thing. Just like the Rome car chase sequence, the climactic moment of the Austria snow mountains plane scene is underwhelming. Especially when you consider how easily Bond takes an out of control plane, barreling down the side of a mountain, and uses it to slam a car in the exact right spot that will injure or kill all of the bad guys, and somehow not injure their hostage. Ridiculous. It takes a long while before we get to a train scene where we get our one and only Dave Bautista fight sequence. It’s a good scene, but what a waste of a cool character to have this be it. Mr. Hinx is given next to no dialogue, no mention of his name, and is barely in the movie. He should have been saved for the ending like some of the great Bond villain henchmen (Odd Job, Mayday.) Instead, it’s a quick train fight and then off to the enemy complex. This is where we get to meet the real villain of the movie, Oberhauser. Sure, we saw him in that all too brief silhouette scene, but that was merely one scene, with the character barely visible, and the movie is now well over an hour in. The movie continues to run into problems. From a stupid meteorite speech to a botched torture scene (clearly meant to be like the laser scene in Goldfinger,) this one is just a mess. At times in the final act, you can tell the movie wants to be a team film like the Mission Impossible movies, bringing Bond together with Money Penny, M, and Q. It should have focused more on the things that make a Bond movie unique. The action and the villains. Neither one is handled well, and the movie suffers as a result. The slow middle, of Bond going from place to place, tracking clues, just went on too long. It gave us one clue too many. The movie did a nice job of attempting to tie in the previous villains of Bond movies, but they were all lumped together and felt crammed in. Maybe this movie could have have given us quick flashbacks of clips of each of those guys. Spectre gets by as an okay movie, due to the talent involved (Craig as Bond, Waltz doing whatever he can with the limited role, even Mendes as a director,) but this movie made a whole lot of mistakes and really should have known better.